Looking for a New Lexus RX Hybrid in your area? CarGurus has 251 nationwide Lexus RX Hybrid dealers with 4,533 new car listings. More than 20 years after its initial release, the Lexus RX Hybrid, most recently updated for 2017, continues to serve those who desire crossover functionality complemented by luxurious amenities and excellent efficiency. That winning formula carries over for 2019 without any significant changes. Like its RX sibling, the 2019 RX Hybrid is available in two-row and three-row configurations, denoted by the 450h, 450h F Sport, and 450hL trims. The gas-powered RX and the hybrid share styling, the latter deviating a bit with its unique badges, but still featuring the expansive and expressive grille, sharply creased sheet metal, and athletic stance. The hybrid model comes with 18-inch alloys, and the front end is accentuated by LED headlights and fog lights. The rear features an integrated spoiler and noticeably sloped rear window. The RX 450h F Sport can be recognized by its black honeycomb grille, black exterior mirrors, and unique 20-inch dark chrome wheels. Offered exclusively with all-wheel-drive (AWD) capability, the 2019 RX Hybrid utilizes a 3.5-liter 6-cylinder engine linked to a continuously variable transmission (CVT), and hybrid components including a 37-kilowatt nickel-metal Hydride battery pack and three electric motors. Net horsepower equals 308 horsepower, while fuel economy is rated at 31 mpg city, 28 highway, and 30 combined for two-row versions, or 29, 28, and 29 for the RX 450hL. Occupants of the 2019 RX Hybrid are treated to accommodations one would expect of a luxury crossover, including leather and wood accents, a sliding second-row seat for those needing extra leg room, dual-zone climate control, a power-adjustable tilt-and-telescopic steering wheel, and a power liftgate. The F Sport takes things up a notch by adding a sport-tuned suspension, paddle shifters, special gauges, accent stitching, and aluminum foot pedals. Buyers craving extra creature comforts can select from a variety of individual options and packages that deliver upgrades such as heated and ventilated seats, a panoramic moonroof, multiple driver memory settings, and ambient lighting. The RX Hybrid’s assortment of desirable amenities also extends to the various infotainment features. Standard on every model is smartphone integration that makes a host of apps easily accessible via voice commands or the 8-inch touchscreen mounted atop the dash. Lexus is in the process of incorporating Apple CarPlay and Android Auto functionality into its lineup, but those features are not yet available in the RX Hybrid. However, buyers can subscribe to different Lexus apps that provide Wi-Fi connectivity, personalized navigation assistance, and remote operation of certain vehicle systems using a smartphone or smartwatch. Though the 2019 model has not been evaluated, the identical 2018 RX Hybrid took home a Top Safety Pick award from the Insurance Institute for Highway Safety (IIHS), and while the 450hL scored 4 stars from the National Highway Traffic Safety Administration (NHTSA), the rest of the lineup scored 5 stars. Contributing to the safety effort are pre-collision and lane-departure warning systems, six airbags, autonomous braking, intelligent cruise control, and an optional blind-spot monitor featuring rear cross-traffic alert. Each 2019 RX Hybrid also offers stolen vehicle tracking, accident notification, and emergency assistance. The Lexus RX continues to gain competitors, including the forthcoming Lincoln Aviator. 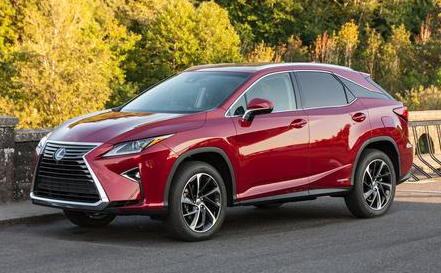 But thanks to an abundant variety of advanced technologies, an attractive design, and a 308-hp powertrain promising up to 31 mpg, the 2019 Lexus RX Hybrid is a strong contender in the luxury crossover segment. What's your take on the 2019 Lexus RX Hybrid? Have you driven a 2019 Lexus RX Hybrid? Enter your zip to see incentives for a new RX Hybrid in your area.